The use of gabions in outdoor spaces is nothing new. Derived from the Italian word “Gabbione”, meaning “big cage”, these containers have served a number of purposes through history. Originally made of wicker, rather than the wire we’re used to seeing, some of the earliest reported uses are of the Ancient Egyptians utilising these cages to protect the banks of the River Nile around 7000 years ago. This practise of erosion control became more widespread during the 19th century, with gabions commonly used to stabilise shorelines, banks and slopes. In medieval times, gabions were effectively used as military fortifications, mainly for the protection of artillery. The lightweight nature of the cylinders enabled simple transportation, and once in position these were generally filled with soil. This practical design and inherent strength ensures they are still used in this way today. Perhaps most interestingly, Leonardo Da Vinci designed a type of gabion for the foundations of the San Marco castle in Milan. Today, whilst they continue to be used for many of the same purposes, their appeal has grown. As landscape schemes become more integrated with their surroundings, the use of gabions for fencing, walls, planters and seating is becoming more common, providing contextual links between buildings and the environment, creating a seamless transition between structures and the landscape. Today, these cages can be seen in use as boundaries and privacy walls, acting as visual and acoustic dividers in outdoor spaces and being used to provide softer, less severe divisions between spaces. Their usage in landscape projects is not limited to walls. Shorter cages are often used to form unique planters, and cages of differing heights can effectively be used to create benches and outdoor seating areas. When a variety of gabion based structures are introduced into landscape design schemes, this coordinated approach can create a stunning visual impact. A key factor in the growing popularity of gabions is how they allow projects to sympathetically match their surroundings. By infilling cages with locally sourced materials, new spaces can easily be tied into the culture of an area and structures become harmonised with their location. In many projects, waste is reduced by simply reusing unwanted site materials for infilling. Clever use of filler materials can create visual interest through layers, shapes and patterns, in some cases the materials themselves (broken ceramics and bricks, shells, logs and more) providing the interest. 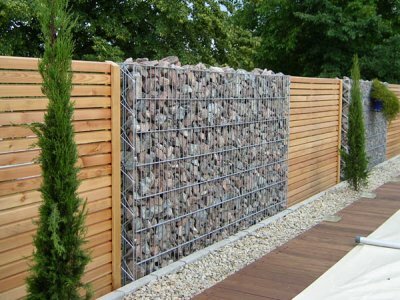 Gabions provide strong and durable solutions, with little excavation work or land preparation required. Have a look at our Pergone range of walls, planters and bench seats to see how you can enhance the natural appearance of your designs.